Part of the common challenges that young people face in Macedonia are youth employment and youth inclusion! More than 70 meetings were implemented with representatives of municipalities, NGOs, as well as with institutions working with youth on a national level. We have made great steps forward and already in 2019 we hope that the youth banks will start working in 5 municipalities in Macedonia, and in a short period of time to expand in many other. So far, 2 capacity building activities for the creation of youth banks in Macedonia have been held, in which the participants shared their further expectations from the Network and what the exact model of the youth banks will mean for their organizations. With the assistance of this model, we want to place the youth in the center: they will not only gain employability skills and the most important- life experience, but they will have the power to decide on their own! We want to introduce an innovative model that will encourage youth employment in Macedonia. We hope that this successful story that creates a new value for a significant improvement in the lives of young people will be fully and successfully introduced and implemented in Macedonia. 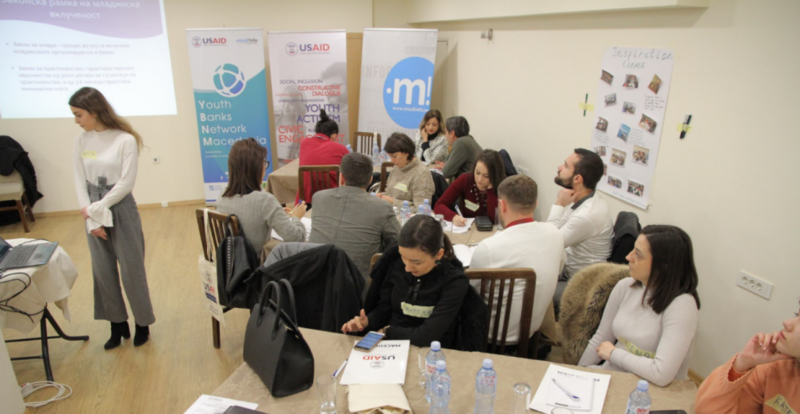 The project Youth Bank Network – Macedonia is supported by USAID’s Civic Engagement Project-Macedonia.